As I mentioned earlier, I’m making an effort to eat better. I’ve never been not an adventurous eater, but I’m certainly not adventurous for myself. You can learn more about my effort here. You can follow along on my Foodstagram @foodemilieeats and by looking at my hashtag #foodemilieeats which preceeds the account. What do your breakfasts normally look like? I’m a huge fan of cereal because it’s so quick and easy. Being the child I am, I like my cereal sugary and delicious. Last week, I was going through a box of Fruit Loops. I also really like the adult/good-for-you cereals. I’m a huge fan of Quaker Cereal Oatmeal Squares too! I don’t normally have bacon at home, but in Georgia, where I’m visiting my boyfriend, the four still growing boys going through bacon like crazy. I decided to have bacon with my breakfast one morning and made it into a smiley face. Yes, I’m a child. Casey had a morning the other day where he didn’t have PT, so when we woke up he asked for Cinnamon Buns, something I’d normally never even think about making for something other than a lazy Sunday morning. Believe it or not, but I don’t think I’ve ever made these before myself. I’m scared of the can popping enough that I don’t buy these sorts of things. 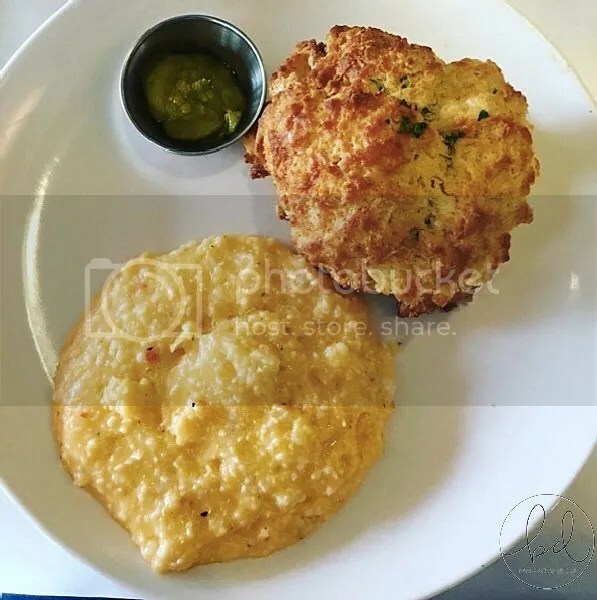 I went to The Buttermilk Kitchen in Atlanta with Casey for brunch last Sunday and it was OMG SO GLORIOUS. I posted this picture, but I’m definitely going to be sharing more soon. So, so, so, so, so, so good. Chef Suzanne Vizethann won Chopped (Season 8, Episode 2) and after eating her food I’m not surprised. I’m going to be talking more about our experience at The Buttermilk Kitchen soon! I mentioned that I spent time at the Atlanta 7s festival and tournament. While I don’t normally like to eat terrible food, sometimes you have no choice. Famished from a morning of refereeing on an empty stomach, I got a stadium cheeseburger that was one of the worst cheeseburgers I’ve ever had in my whole life, but it was food and I survived. Perhaps most in-line with what I’m trying to do with this effort is that last picture- I made homemade mashed sweet potatoes. I knew I was leaving for Atlanta, but still had three sweet potatoes that wouldn’t survive the 18 days I was going to be gone. I boiled them, added a tablespoon of butter, and put it all in my roommates Ninja Food Processor. Ta-Da! It was delicious. I had some that night and then freezed the rest, which will be perfect for when I get home! That’s been my aventures in food lately. Any new recipes you’ve tried lately?